and also desirable for gaining wisdom, she took some and ate it. There is so much brokenness and beauty in the world. We are prone to forget that these two realities happen to be next-door neighbors. We walk towards beauty only to find that we have landed in brokenness. From the outset I am drawn to the beauty of Luce’s work only to discover that something else is at play. There is an edge, a spike, a death. I can almost see the radiance falter before me, the life force being sucked out of the vine. In Trespass one is drawn to surface tones of aqua and red that are not-quite-bursting forth from the petals at the bottom of the piece. Is this a kind of pan-flute whose pipes play the song of a decaying melody? There is a melancholy that develops as the tune appears moldy, either from disuse or neglect. Misconception is a kind of plant-like assemblage where pedals and pods have seemingly been dragged through the mud. There is a kind of gaudy beauty that oozes forth from this piece. One is left to wonder if restoration is possible or even desired. 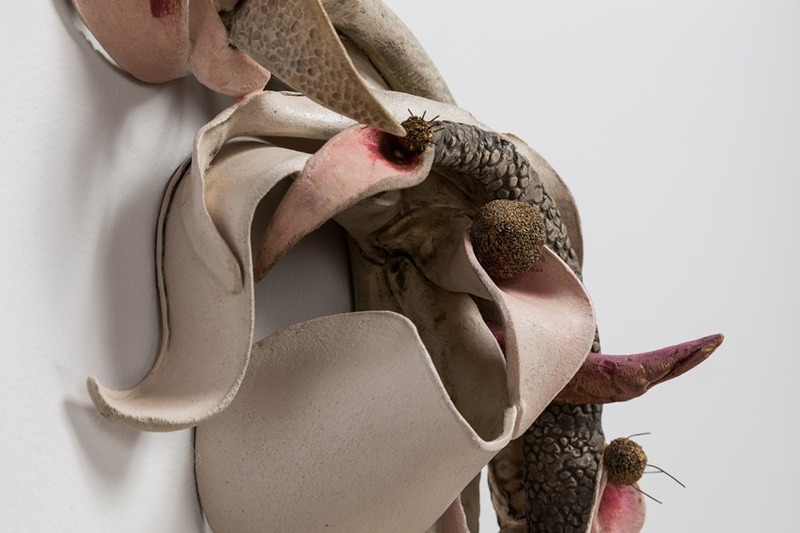 Allison Luce: Matchless (detail), 2014, fired clay, underglaze, glaze, oxides, mixed media. 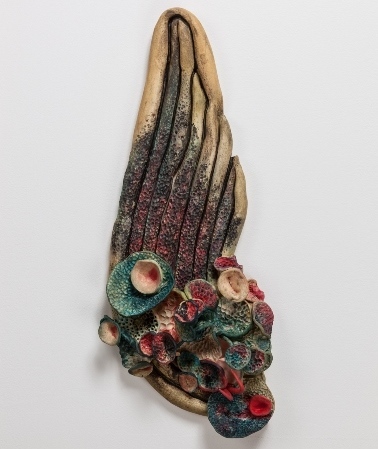 Allison Luce: Trespass, 2014, fired clay, underglaze, oxides, mixed media, 25” x 11” x 5”. 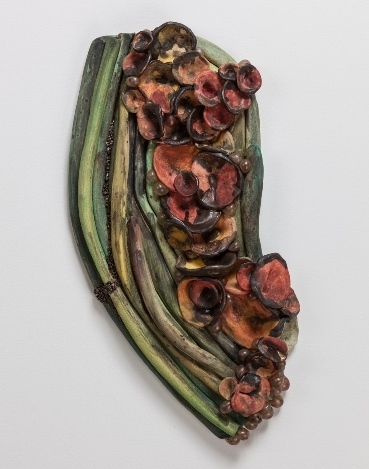 Allison Luce: Misconception, 2014, fired clay, underglaze, oxides, mixed media, 21” x 10” x 4”.